But currently, the Raspberry Pi is spending a good 60% of it’s time, simply scanning and responding to inputs. Thus, my plan is to outsource all of that to an Arduino UNO, leaving the Raspberry Pi only to have to deal with graphics, sound, and game logic. 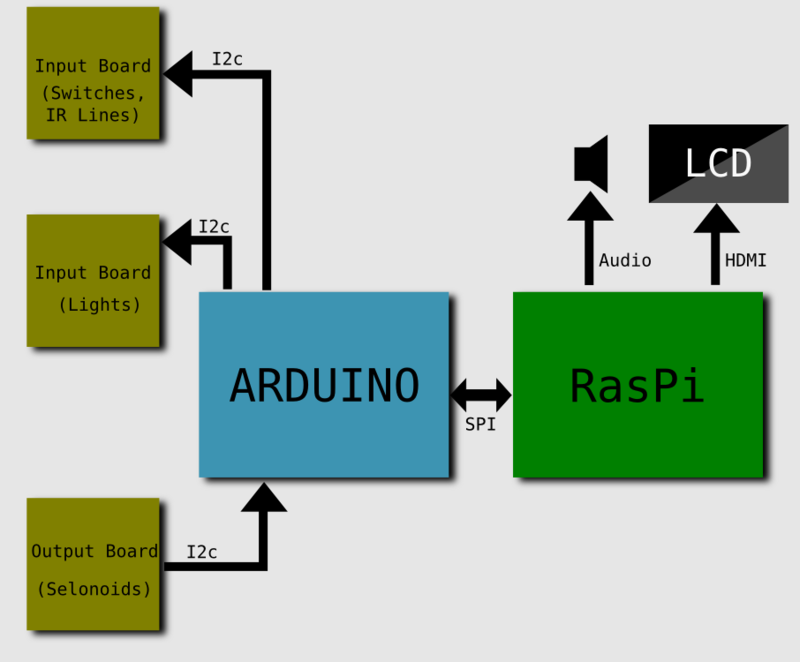 I2c buses connect all the boards to the Arduino, and then it is networked to the Raspberry Pi via an SPI link. I’ve never touched an Arduino before, so this is exciting for me. From what I’ve read they’re really simple to use and program. This should be fun! Hola, que resultados ha tenido la implantación de este proyecto ? The Pinball Machine has not been worked on in several years. I do want to finish it though! Just need the inspiration. Since 2014, I have gotten married and become a father, so life has changed a little. I work on other projects too, so check back as I plan to update it more.